A new luxury home has hit the market in Atherton on a private cul-de-sac street. My new listing has 6 bedrooms, 5.5 baths and is approximately 7,000 square feet. It sits on just over one acre and has beautiful landscaping as well as the perfect setup for the family that likes an outdoor lifestyle or entertaining. There is a pool, hot tub, lots of patio decking for parties, putting green, sand volleyball court and huge grassy area for playing any kind of family games. The interior of the home is very spacious and light filled. The six bedrooms are all generous in size and there is also a large office/den as well as bonus room that can be used for a workout room or media room. The family room is large and just off the kitchen, so it creates the perfect hanging out area, that also happens to lead to the pool and outdoor entertaining areas. This luxury Atherton real estate listing can be seen by appointment only by calling Gary Kurtz of Alain Pinel Realtors. The asking price is $6.999 million. 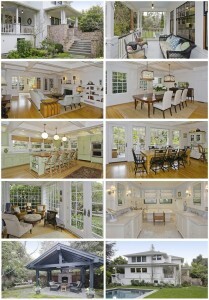 The virtual tour will show you more pictures or you can go to my APR website for more information. Atherton has seen a surge in purchases of luxury real estate recently and homes in the 5-20 million dollar range have been selling, despite the sluggish economy. Atherton California is one of the most expensive areas in the country, having ranked #2 for highest average listing price. Sales prices in Atherton of luxury real estate stayed strong in the 3rd quarter of 2010 compared to the 3rd quarter of 2009. Despite the economy and general gloom and doom news, it was surprising to see the prices jump for the Atherton real estate market. Prices increased while the number of sales took a big dive, dropping almost 40%. Since the inventory levels also took a huge increase, this means that the inventory is there, but buyers are being very selective. Realtors and home sellers are hoping for an end of the year surge in sales. The best case scenario for a buyer is in place due to the high amount of inventory on hand. Atherton real estate was just named by the Wall Street Journal as the second priciest area in the country, coming in only behind an area of New York. So, in essence, real estate in Atherton is the most expensive on the west coast. Real Housewives of New Jersey Home Up For Auction! Reality TV stars are celebrities too, and they have financial problems just like the rest of us. And now, you might be able to get the chance to buy her home at auction. I’ve heard there is an upcoming auction involving “Real Housewives of New Jersey” personalities Teresa and Joe Giudice: The contents of their lavish 10,000-square-foot New Jersey mansion are scheduled for auction on Aug. 22. This luxury estate could be yours, although camera crews are not included. It was originally a local affair. Auction house A.J. Willner says it received so many inquiries from around the world, it decided to add an online component. Potential bidders can sign up at Proxibid, a website that does as many as 800 auctions a month and reports bidders from 175 countries around the world. Items involving celebrities – or, in this case, reality-TV personalities – can command a premium, says Bruce Hoberman, Proxibid’s president. A $750 silk Mets jacket once owned by convicted Ponzi schemer Bernie Madoff commanded $14,500 in November. 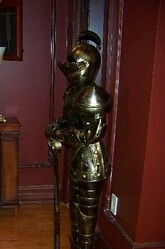 The suit of armor is expected to be one of the more popular items. In this case, it is unclear exactly what will be up for grabs. The Giudices, who filed for bankruptcy protection, formally objected to the auction, says Mike Sklar, a partner with A.J. Willner. A hearing is planned Aug. 16. The couple-who could not be reached because their phone is disconnected–says some of the items scheduled for auction were purchased after the bankruptcy petition, while others belong to relatives, Mr. Sklar says. Such objections are typical, he adds. If a judge allows the auction to proceed, Mr. Sklar says he’ll rush to inventory the Towaco, N.J., mansion and what’s left of its fancy contents. Items possibly up for grabs include a grand piano–expected to be popular –a suit of armor, snow plow and foosball table. This shows everybody is effected, even tv stars. I guess it actually is a reality show. Luxury Real Estate from all areas of the country are having their ups and downs. On a year to year comparison, the average listing price and selling price of luxury real estate in Atherton were both up in listing and sales prices. The average selling price was $2,689,000 while the average Atherton home for sale had a listing price of just over $5.5 million dollars. Knowing that Atherton real estate has about a 93% list to selling price ratio, I’m sure there will be further increases in sold prices for the month of January as well as listing prices. We are seeing lots of buyers out there looking for luxury real estate in Atherton and many with cash in hand so the loan process won’t impact the sale. Our office is having more high end sales in Atherton so far in January than it has in the last couple of years for the same time period, so despite the economy, luxury real estate in Atherton is still on the highly sought after list of places to live.